Less than a week ago, we here at One Ghana, One Voice announced a large project: we had asked 93 poets (almost all Ghanaian) about their poetic influences, and had scheduled to reveal the answers to those questions over the coming weeks (you can read the introduction to the project here). It was to be a celebration. Early on Sunday morning we posted the first of those results, which showed that, by a slim margin, Ghanaian poets are now saying that African writers are their greatest influence. Not 18th century British poets, as it once was. Not 20th century Americans, either. But African poets, especially Ghanaians. Brew, Anyidoho, and first among them, Kofi Awoonor. I am certain that had it not been for Awoonor and his influence both as a poet and a teacher, Africa would not have topped that list. The final "reveal", not set to be announced until mid-October, answered the question: "Which one single poet most influences Ghanaian poetry?" It seems absurd to withhold the answer until then - by a large margin the new generation of Ghanaian poets said again and again: Kofi Awoonor. Kofi Awoonor. Kofi Awoonor. The poet. The professor. The diplomat. The leader. Kofi Awoonor. So what a haunting, sickening shock it was to read only hours after that first post: Kofi Awoonor killed in Westgate Attack. There has been too much mourning of late for Ghanaian leaders, and for poetry. Only last year we gathered together, stunned and saddened by the death of John Atta Mills, and only weeks ago we were greeted with word of Seamus Heaney's death. And now, here we are again, with this most alarming and disturbing of news. 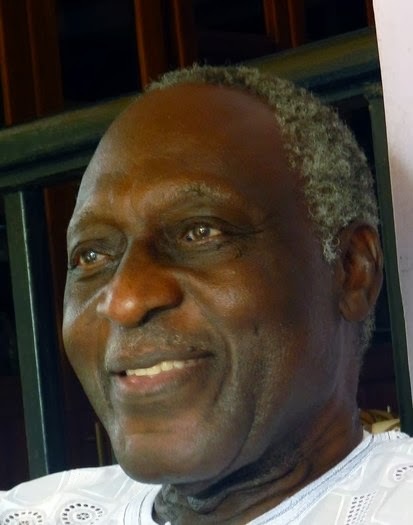 The one consolation I take from this event is that Kofi Awoonor was able to live so long, until age 78, and was able to provide the world with so many of his poems and so much of his knowledge. This only makes it that much more difficult, however, to read the news of the young people and children also killed in the attack - the contributions they were to make to our world, that are now lost, we will never know. So it is with heavy hearts that we are suspending our series reviewing Ghanaian poetic influences so that we can focus on one, Kofi Awoonor, and celebrate his life and his legacy. Through celebrating him and his art, I hope we can all find a time of healing and reflection - to know what has been lost, to celebrate what has been accomplished, and to be vigilant to change the world for the better. Similar to our series of poems following Presiden Mills' death, we are now announcing an open call for poems on Kofi Awoonor. Please send your poems to oneghanaonevoice(at)gmail(dot)com, and include a one-line bio in which identifying yourself and where you are writing from. You can also, optionally, add a short note on how Kofi Awoonor and/or his writing have personally affected you. Once we are finished this tribute we will return to the series announcing Ghana's poetic influences, at the end of which we will reaffirm Kofi Awoonor's place at the top of that list, where he has long been, and long will remain. Thanks for your commendable regards to the memory of late Kofi Awoonor which necessitated your considerate decision to temporarily suspend the series reviewing Ghanaian poetic influences so that we can focus on his tribute series. It is indeed a very wise decision. Just like OGOV’s wise decision to suspend other series on its blog, the Storymoja Hay festival was also brought to an abrupt end on Saturday evening "in sympathy with those who have lost their lives or were injured" and for the safety of attendees. Well, I really don't know what to say. The shock and anguish is yet to abate. I wish to extend my sincere commiseration to the immediate family of the late Kofi Awoonor, and also to the entire people of Ghana, Ghanaian and African academia, Africa as as a continent and also to the diaspora. You have my condolences. the feast of oneness whose ritual we partook of." Oh, what a coincidence! These were the same lines LS Mensah used as condolence message to me when I lose my own father in August, 2010. Now it's my turn to extend my own condolence messages to mourn the writer of the poem that was used to console me, even though I know that I am indeed also one of the chief mourners. Oh, how transient is life... what absurdities... what futility.... Is the Myth of Sisyphus truly a reality or a hoax? because that is when all dirges end. Efo Kofi, hede nyui, ya wor odwogbaa!